China will try to attract more students from countries along the Belt and Road Initiative, education officials said at a news conference on Wednesday. 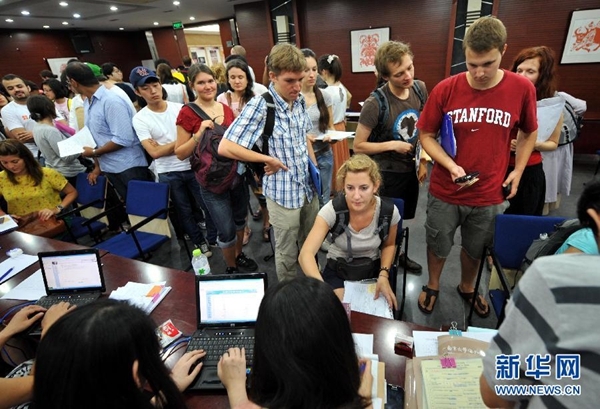 The students are expected to become the majority in China's international student group in the years to come, the officials said. Recruitment of students from those places will be a "mission of great significance" for the Ministry of Education going forward, said Xu Tao, director of the international cooperation and exchange department. Xu said the ministry would also open more courses taught in English and would grant the Chinese Government Scholarship to at least 3,000 freshmen from nations and regions along the Silk Road Economic Belt and the 21st Century Maritime Silk Road each year, to make studying in China more attractive. "We have seen many talented young people from all over the world become top experts or senior officials of their own countries after they returned from studies in China," Xu said, adding that many of them have played key roles in maintaining a good relationship between China and their native countries. In granting the Chinese Government Scholarship, the ministry takes China's development strategy into account, said Mao Dongmin, an official in Xu's department. That means students from Belt and Road countries who apply for energy, communications, transport, marine studies and finance in China will have a comparatively bigger chance of winning the scholarship, she said. She added that the ministry is working with other ministries and commissions to understand their needs and help to nurture talent accordingly. By cooperating with the National Energy Administration, for example, Mao said they know that China is planning to "go global" with nuclear power technology. Other countries, such as Pakistan, are important partners in the process. "What we could do, from the perspective of education, is to lure students from the partners and fund them to study related majors in China," she said, so that the students provide intellectual support for the nuclear power expansion. Belt and Road countries have worked closely with China in education since the ministry issued a notice in July to boost educational ties. So far, China has signed agreements on the mutual recognition of academic degrees with 46 countries and regions around the world. More than half are along the Belt and Road, said Yan Bingchen, an official of the ministry's international cooperation and exchange department.